Being a part of Francesca Zambello’s production of Die Walküre has raised the bar for me yet again on my operatic excursions as a “Super” at the San Francisco Opera. CHECK!…another dream fulfilled. This time Wagner! When I pass over the scratched and worn stage floor, I still pinch myself and marvel at all the legends who have left their mark in this hallowed place. Here’s a photo-narrative glimpse into this exciting production, and my wonderful world of Wagner. When’s the last time you saw a Wagner opera and weren’t wishing singers of the past were instead onstage? Well, it would be hard to best this nearly peerless cast, particularly in today’s international crop. Eva-Marie Westbroek as Sieglinde is utter perfection, with a refulgent, voluminous voice, and yet, there’s such a naturalness to her delivery, it’s as if she’s speaking. She exudes considerable warmth in her very convincing acting expressions, and as one reviewer said, she couldn’t play the victim better. She also couldn’t look the part more (as evidenced by this glowing photo). She, and all the principals are a joy backstage too. Given the pressure they’re under to perform a VERY difficult piece, that’s quite a testimony. In her debut as the Walküre Brünnhilde, Nina Stemme delivers the much expected stamina and bravado, but never betrays her beauty of tone, or pushes outside her “column of sound.” She uses her slighter stature and strong connection to her body to paint an authentically youthful and feisty characterization. No, she doesn’t erase memories of Nilsson’s vocal sword throwing in the highest reaches of “Ho-jo-to-ho!,” but she has a far darker, warmer, and more alluring tone, and greater physicality than Nilsson. Mark Delavan is tireless, and the model of godly alpha-male strength as Wotan. At times he sings with a legato line, but other times chews up and spits out the german consonants to portray anger, or when commanding others. Backstage, he’s the funniest opera personality I’ve ever been around…cracking up the Supers without fail, with his disarming humor. Enjoy his perspective on Wotan, and at times refreshingly irreverent sense of humor in this interview. Christopher Ventris as Siegmund is in the Heppner/Windgassen vein, having a brighter, not baritonal Heldentenor tone. However, he is easily heard, and has plenty of thrust to cut through the orchestra. He and Eva-Marie make an appealing and very engaged duo. Ray Aceto as Hunding is genuinely scary and imposing, and wields a very satisfying black basso. Janina Baechle as Fricka doesn’t erase vocal memories of Marjana Lipovšek (‘95), but she is quite perfect in this production’s conception of this role, and is fully and excitingly committed. 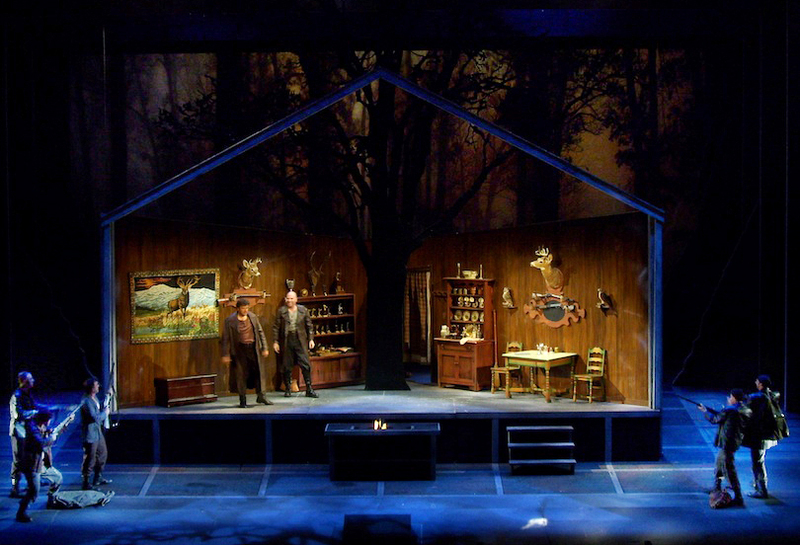 Christopher Ventris (Siegmund), Ray Aceto (Hunding); Photo: SF Opera Production Dept. In this Act I play one of Hunding’s thuggish *insert grunt here* kinsmen, returning from a day of hunting. I carry in a giant plastic-wrapped meat pack, which I immediately throw to Hunding. (Yes, me, the one who couldn’t throw a ball to save his life as a kid…WHY?!) We all threaten Siegmund with our rifles when he hesitates Hunding’s commands. (I’m at bottom left.) Later Sieglinde ladles us up some slop (aka bloodied plastic cubes) from a giant pot, presumably whipped up from the meat I tossed. Mmm-mmm good! Another Super carries a rope with two rather sad, dangling fowl. Not surprisingly, the kinsmen have been likened to the “Michigan Militia,” present-day paramilitary thugs.